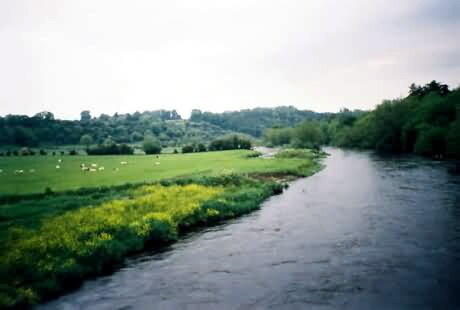 The Megalithic passage tomb at Newgrange Ireland is over 5000 years old & part of the Boyne Valley necropolis, which also encompasses the Knowth & Dowth prehistoric sites. The Irish megalithic passage Tombs at Boyne Valley, Co. Meath, including Newgrange, Knowth & Dowth, were constructed circa 3500 BC, before the Pyramids of Egypt, according to radio-carbon dating analysis of the Newgrange site. Irish countryside & sheep grazing at Brú na Boinne, Co. Meath Ireland image - adjoining the ancient Irish megalithic site of Newgrange. From William Scott-Elliot's The Story of Atlantis & the Lost Lemuria published 1909. The exact use & original purpose of the passage tombs of Ireland has long been debated between traditional archaeologists & those who see a deeper significance to the stone structures. 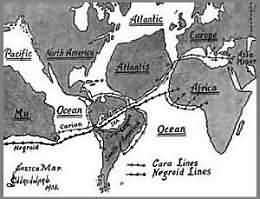 Some speculate that the astronomically aligned sites at Newgrange, Knowth & Dowth were built by survivors from the Atlantis continent which once may have existed in the Atlantic Ocean, to preserve ancient teachings. Those who have stood in the centre of a Ring Fort or near ancient standing stones may understand the tranquility and feeling of Oneness with the Universe such a casual encounter with our Celtic past can evoke. Kerb stone at Newgrange with spiral symbols. At Newgrange, sunlight during the December winter solstice illuminates the inner passage & Chamber annually. Similarly in the Egyptian Pyramids, the ceremonial inner sanctum was aligned with the Pole star & constellations. During 1999 a Canadian scientist discovered a prehistoric map of the moon's surface engraved on stone within the inner chamber at Knowth, It was part of a rock carving which was highlighted by the nocturnal lunar light. BBC Science Report. There are also similarities in the construction of Irish passage tombs & the later pyramids of Egypt, in particular the ancient Egypt structures at Abu Simbel. At both locations, astronomical alignments play a key role in the significance of the structures. Many believe the ancient stone sites are/were charged with an energy or power. The stones are decorated with ancient spiral symbols depicting the site's location. Newgrange Ireland video clip courtesy of National Geographic. 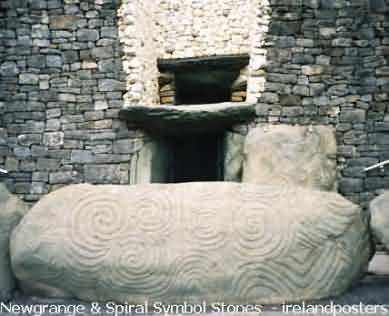 Newgrange roof opening & entrance kerbstone with spiral art. Wall print. Portal tomb in The Burren, Co. Clare. Ireland coffee mug. View a photo-guide to historic Dublin monuments & famous Irish landmarks. Irish posters & Ireland pictures - main contents.